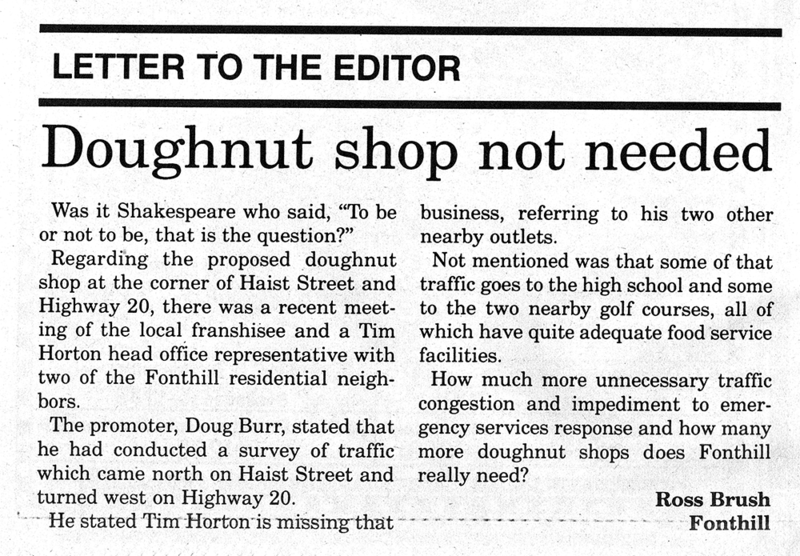 In September 2004, the granddaddy of all letter topics—the new arena—was yet but a twinkle in Council's eye. Recently it has come to our attention that a decision has been made to eliminate the crossing guard at the corner of Haist Street and Pancake Land in Fonthill. This us unacceptable by all concerned parents who have young children that walk down from A.K. Wigg elementary school. On May 30, there were 59 children in Grade 4 or lower that safely crossed Pancake Lane. These children are under the age of 10 years. On June 5, a count of all students that were crossed by the attending guard, regardless of age, was also taken. There were 104 crossings of Pancake Lane and nine crossings over Haist Street. How can the mayor and councillors justifiably eliminate such an important crossing guard? Not only are there a great number of children entering this intersection, but this is a very busy and unusual intersection. Cars travelling west on Pancake approach the intersection on a downward slope. Very often in slippery winter conditions it is difficult to come to a complete stop. Another hazard is the fact that the east and west sides of Pancake are not aligned. Very often you will see cars enter Haist from the west side of Pancake with the intention of making a quick right-hand turn onto the east side of Pancake. Should there be a child in the crosswalk, an accident is sure to happen. Currently there are no white lines delineating the crosswalk area, nor is there a broad white line indicating the stop sign to drivers; yet another hazard to the safety of our children. It is difficult enough for these young children to cross a single busy street in which they deal with only two directions of traffic. What you are asking them to do is check traffic coming at them from four different directions. Once they get around to the fourth, traffic will be oncoming from the first direction checked. The expectations of these young children is beyond their years. The decision to eliminate this guard was on the basis that the “safe gap times were quite frequent at the Haist Street site.” In a half-hour period June 6, 278 vehicles crossed through this intersection. How can you possibly believe this allows ANY safe time gaps? On June 7, an average of 9.5 vehicles per minute and an average of 3.5 children per minute were recorded. This ratio certainly favors the vehicles over the well-being of our children. Also worth noting is that children do not have the same perception as far as distance and speed of travel, that we, as adult drivers, do. They may believe that they have time to cross when they don’t. How can the voting members believe this is a risk worth taking? Counc. Dave Hall hit the nail on the head with his comment in the Pelham Herald (June 5): “If there’s a tragedy at one of these areas its going to reflect on each one of us on this council.” How can you having voted in favor of this decision have this looming on your conscience? The vote in favor of eliminating this crossing guard was wrong. Budgets are tight and spending must be reduced, but is it possible to put a price tag on the lives of our children? Are our children only worth $11,300? I would hope that everyone involved in this decision believes that our children are in fact priceless. I trust that this issue will be re-evaluated. A rumour going around town says Bill Snyder is a crazy old man. Not knowing Mr. Snyder’s age to determine how old old is, or if he’s undergone a psychiatric assessment for craziness lately, it would be negligent of me, if not slanderous, to support this gossip. Although I readily admit to what I don’t know, there are a few things that I am very sure of: politicians hate whistleblowers, and Bill Sndyer has assumed the job of the Pelham Town Council Whistleblower. He’s been blowing a very determined and unrelenting whistle on this tax vs. budget increase issue for months. For anyone who is not familiar with the term “Pelham Town Council Whistleblower,” it is a person, or persons, in the Pelham region who are intent on making plenty of controversial waves in what is normally a tranquil, unquestioning community. It is the job of a whistleblower to call the public’s attention to, and point out publicly, the indiscretions or wrongdoings of our elected officials, or those who break the law to hurt, or take advantage of our citizens. Whistleblowers, if successful, rile people up, get them shaking their heads in disappointment, and doubting the ability of our politicians. Who can forget Clinton’s pal Linda Tripp, Enron’s Sherron Watkinsy, and Erin Brokovich’s legal campaign against Pacific Gas and Electric. Now I’m not suggesting for one moment that Bill Snyder is in the same category as these famous whistleblowers. But in our little, spit-in-the-bucket, town, he’s the only tweeter we’ve got right now to keep our Pelham politicians on their toes. We all hope our town councillors will be true to their campaign promises, just like they hope to keep the budget or tax increases between 5 and 7 percent. Whatever! Do we believe them? In our heart of hearts, we won’t be betting the bank on it. Rather, whether we like it or not, one way or another, we will be crying all the way to the bank. Because we all know there’s a fine line between budget and tax increases. So if Bill Snyder wants to go blue in the face blowing his whistle at Town Council meetings, it doesn’t make him a crazy old man. It makes him a successful whistleblower. Hey, he’s getting himself quoted in the local papers on a regular basis, and he’s got people talking and questioning our Town Council. Why can’t they do the math? Why can’t they keep their word? As I see it, there’s a fine line between hoping and wishing too. If the Town Council is sitting around chambers hoping and wishing on issues as important as budget and tax increases, as a taxpayer, that’s not working for me. The difference between me and Bill Snyder—I have no desire to be a whistleblower. Good Lord! Do I want to be called a crazy old woman ’round town? No, thank you. I’m happy in my silent majority niche. But that doesn’t mean I’m not keeping a wary eye on the Town Council. I’m taking some very good advice that was given to me from my grandfather years ago, Judge W.T. Robb, an old man but not a crazy one. In two years from now, when the cobwebs are dusted off the campaign soapboxes, believe me the pledges to keep taxes down and promises to create a budget that really works will be oozing out of the woodwork again. We’ll be able to hook up a wind generator to the flapping Whopper J. Fibber lips. When this happens, I’m not just going to hear a whistle blowing way in the back of my memory, I’m going to be seeing red flags. The Voice of Pelham has reported that both Pelham Council and the Pelham Library Board considered my opposition to Pelham’s repressive budget and tax increase irrelevant. Rumour has it that a Council member has been telling constituents that Town Council does not take Bill Snyder seriously because he is crazy. It seems I have been dismissed by the bureaucracy as well as labelled irrelevant and crazy. Could this be another display of the change, openness, transparency, accountability and fiscal responsibility we were all expecting from this municipal government? Politicians and government-appointed boards hate whistleblowers, and I have blown the whistle on this deceit, so as usual, the chosen defence is the effort to personally attack and discredit the complainant. I am sure the taxpayers wish as much effort had been expended on achieving the 5 to 7 percent budget increase target, the written evidence clearly shows as the goal they set. They can spin-doctor it any way they want but I am sure the public believes the truth is what has been documented in writing. I do. Mayor Leavens told the Voice that Council all understood the increase goal was for taxes, noting if a budget increase had been held to, the Town would have had to cut spending by half. The Mayor’s statement mathematically makes no sense and is misleading. Sticking to a 5 to 7 percent budget increase would only have cut in half the amount of the increase over last year’s spending, not this year’s total spending and obviously most of the councillors have not read the minutes of their own meeting to find out that it was a 5 to 7 percent budget increase target they set on Feb. 4 2004. Two important facts tell the true story. simply do not support the Mayor’s comment that the increase goal was for taxes. They specifically say that the increase goal was for budget and this makes a significant difference in the tax we pay. (2) Councillor Brand, who was Chairman of the Budget Review Committee, insists the committee set a 5 to 7 percent budget increase target, and the written minutes, which Council approved and dare not change, back his statement up. These facts cannot be denied and the Mayor has not seriously addressed them. As far as cutting spending in half is concerned, I say “What a novel idea.” Isn’t it about time all levels of government began to seriously consider this approach, because we the taxpayers are running out of money to pay for the excessive assaults on our pocketbooks. My tax bill is more than 15 percent higher than last year and my neighbour’s is over 17 percent higher. We do not have the amenities to justify those increases. Taxes are approximately 56 percent higher than they were five years ago with little to show for it. This does not remotely represent fiscal responsibility. We know if Council had complied with the Municipal Act and applied the surplus of approximately $800,000 their financials say they have, they would not have had to cut any spending and taxpayers could have had a zero tax increase with little or no change in the services they budgeted for this year. However what will silence my opposition more than anything else, will be the absence of a greater number of citizens voicing their discontent about matters like this one, through presence at Council meetings or communication with Council and the press. There must be many more voices in the wilderness, if there are to be any beneficial results. The Canadian way seems to be that the majority will complain to friends and neighbours, the people they meet in the mall, the coffee shop or other places they gather, but they will not carry the effort far enough to cause politicians to change their actions between elections. Politicians know this and count on it. On that note I want to sincerely thank those of you who have offered support through your personal and phone contacts and especially those who showed up at the August 16 Council meeting to support my opposition to this budget/tax increase. Thank you again! It has come to my attention that the Library Board intends to use the Library Board Act to close to the public and press any meeting I should have with them. I have been counselled that a closed Library Board meeting is not the appropriate forum for me to debate the Board’s malicious letter. This would jeopardize other action I take. I have reluctantly accepted this advice so, it will not happen. In order to eliminate any influence the Board may try to exercise over this decision, I have resigned from the Board. Should I choose to continue my opposition to Council’s disingenuous conduct, the Library Board now becomes, should I say it, irrelevant, in an issue they had no business getting involved in. Perhaps it was their requested 21.8 percent budget increase, approved by Council, which made them anxious, especially when the 5 to 7 percent budget increase target was the order of the day. It could also be that they somehow think Councillor Allen’s membership on the Library Board gives him some sort of immunity at Council. I don’t. Besides, I do not see how anyone could justify volunteering in any organization whose executive believes that their membership entitles them to infringe on any member’s democratic rights. It is just not worth the aggravation. The fact of the matter is, we all know after the campaign signs are removed, and our elected officials are secure in their chamber chairs, we again find out that government is always right, even when they are not.